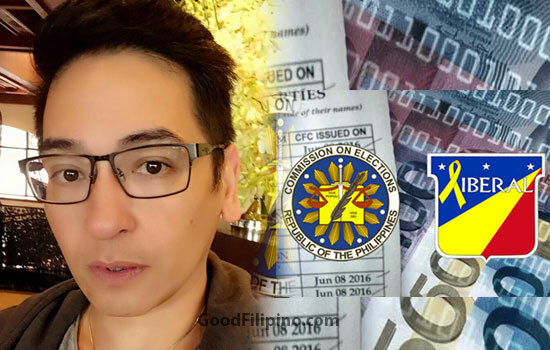 The former super sireyna of 'Eat Bulaga' and now a popular known lawyer on social media has something to point out on the decision of the Comelec on the issue of 'late filing' of SOCE. Atty. Bruce Rivera took his Facebook account and wrote his sentiments about the issue. He frankly said this message, "If that is the argument, eh di sana tinanggal niyo na lang ang COMELEC sa Saligang Batas kasi wala din naman pala silang silbi." Atty. Bruce wants to clarify the facts that Comelec should do because its written on their rules and regulations on the Section 14 of Republic Act 7166 that state "NO PERSON ELECTED TO ANY PUBLIC OFFICES SHALL ENTER UPON THE DUTIES OF HIS OFFICE UNTIL HE HAS FILED THE STATEMENT OF CONTRIBUTIONS AND EXPENDITURES HEREIN REQUIRED." "THE SAME PROHIBITION SHALL APPLY IF THE POLITICAL PARTY WHICH NOMINATED THE WINNING CANDIDATE FAILS TO FILE THE STATEMENT REQUIRED HEREIN WITHIN THE PERIOD PRESCRIBED BY THIS ACT." "THE 08 JUNE 2016 DEADLINE SHALL BE FINAL AND NON-EXTENDIBLE. SUBMISSIONS BEYOND THIS PERIOD SHALL NOT BE ACCEPTED." It was a COMELEC Resolutions Nos. 9849 and 9873, Minute Resolutions Nos. 13-0775 and 13-0823 are hereby repealed, insofar as they allowed the belated submission, amendmentand/or correction of campaign finance disclosure statements and reports and the imposition of late penalties for the 2013 National and Local Elections. Sabi ng iba, by requiring the submission of the SOCE on a certain period and disqualifying the candidate for failure to file same is unconstitutional on the part of the COMELEC because it added a qualification for office of the President, VP and Senators. So, let me get this straight: it is okey for a party to overspend during elections because filing of a SOCE should not be a qualification. So, how will the COMELEC now be able to exercise its mandate to ensure the conduct of a free, peaceful and honest elections if they will promulgate rules on limiting election expenses and providing for penalties thereof and the same will be considered an additional qualification thus, unconstitutional. Kasi nga naman, ang qualifications ay natural-born Filipino (kahit naging Amerikano na and back), able to read and write, at least 40 years of age, of good moral character, a registered voter and a resident for 10 years. Hindi daw kasama ang "must be able to file the SOCE within the period prescribed by law". If that is the argument, eh di sana tinanggal niyo na lang ang COMELEC sa Saligang Batas kasi wala din naman pala silang silbi. Wala na silang karapatan na magcancel ng COC kahit pa American citizen ang tumakbo kasi kailangan may korte na magsabi before nila pwede gawin yun. Ngayon, sinasabi ninyo na hindi na sila pwede gumawa ng rules ukol sa pagsubmit ng SOCE at parusahan ang hindi makapagcomply nito kasi dinadagdagan ng COMELEC ang qualifications. At mas importante na binoto ng majority ang isang tao, kahit nag-overspend sila at nagpaulan ng pera, binili ang media, binayaran ang dapat bayaran para masiguro ang pagkapanalo nito. Na hindi pwede i-disqualify kasi binoto ng majority. Pagmultahin lang kung ganun kahit pandadaya pa din yun?! Sumasakit ang ulo ko sa mga palusot ninyo ha. Bruce Villafuerte Rivera, worth it ba talaga itong bansang pinaglalaban mo? What do you think on the message of Atty. Bruce Rivera? Please share your thoughts below. Comments or suggestions about "Former Super Sireyna hit Comelec on its rules over SOCE filing" is important to us, you may share it by using the comment box below.